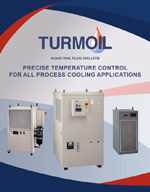 PT Process Chillers | Turmoil, Inc. 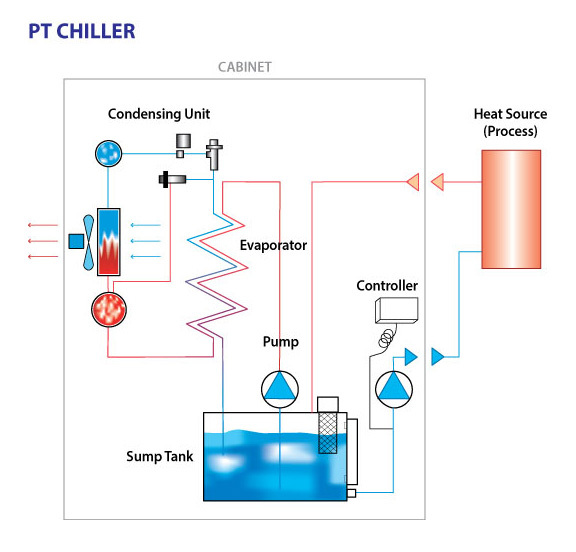 The PT Model Chiller Uses Two pumps with one process tank. One pump circulates coolant through the evaporator to maintain a constant tank temperature, while a second pump circulates coolant from the process tank (on-board chiller) through the process and then back to the process tank. NOTE: This information is being presented as a guideline only. Your specific application, options and requested features may alter the specifications. Please confirm all specifications with Turmoil. WATER BTU/hr Kcal/hr hp gpm lpm gal. ltr. *Capacities based on coolng water to 60°F (16°C) in a 90°F (32°C) ambient. ***Contact our engineers for tank capacity information. Please download our catalog or contact us for dimensions and shipping weight. Contact our engineers for more information. OIL BTU/hr Kcal/hr hp gpm lpm gal. ltr. *Capacities based on coolng oil to 80°F (28°C) in a 90°F (32°C) ambient. These are a few of our basic options. Click the button below to see all chiller options. CTC: Digital Temperature Controller: Provides close temperature control (±0.5°F). Displays bot set-point and coolant temperature. ATC: Ambient Tracking Controller. A dual input digital tempertue controller allows the coolant temperature to track ambient temperature at a constant, adjustable differential. Displays both ambient and coolant temperature. Non-Copper. Oil only comes in contact with iron or stainless steel. NRCW and NRCA: Non-Refrigerated Cooler. Uses central chilled water or ambient air instead of refrigeration. Saves space and maintenance. W: Water-Cooled Condenser For use with tower or city water. Removes heat from the work area while saving space and maintenance. Ozone-Friendly Refrigerants. Turmoil coolers use only approved, non-ozone-depleting refrigerants.